Record Description GRI-11 â€“ boundary stone number 11 of the first 21 around Grinton Parish starting from Stolerston Stile and reaching as far as Gibbon Hill. 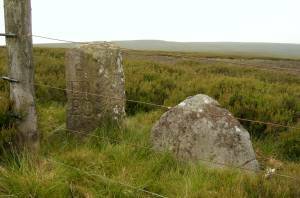 It is on the boundary between Grinton and Ellerton parishes, and is actually two stones standing side-by-side on High Moss. The taller one is inscribed on the east face with S, ED, four dots, and ED. 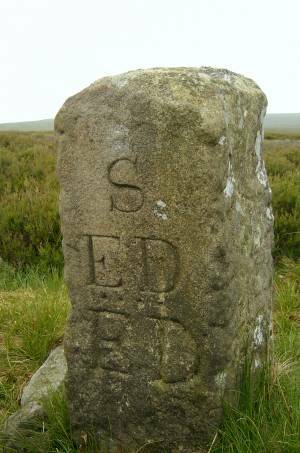 ED appears to signify a boundary of the estates of the Erle-Drax family of Ellerton Abbey, which would date the stone to sometime between 1755 and 1887 (see additional notes below). Why it should appear twice is puzzling. The shorter stone is inscribed on the east face with I+S and above it to the left a letter D at a jaunty angle. The letter D might refer to Drax, the surname used by the owners of Ellerton Abbey estate before 1755 and after 1887. 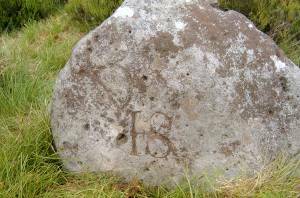 The + symbol between the I and the S is hardly visible but can be seen more clearly on another stone in the series at Record 596. It suggests that I and S relate to two separate family surnames.